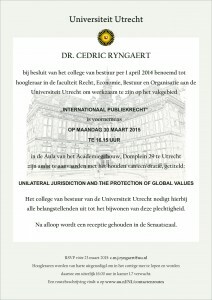 On 30 March 2015 Prof. Ryngaert will give his inaugural lecture as professor of public international law at Utrecht University on ‘Unilateral Jurisdiction and the Protection of Global Values’. The lecture will be held at 16:15 in the auditorium of the ‘Academiegebouw’ (Domplein 29, Utrecht). The Utrecht University executive board invites all those interested to attend this ceremony. Professors are warmly invited to participate in the procession, for which they are expected at 16:00 at the latest in room 1.7. Following the ceremony a reception will be held in the Senaatzaal. 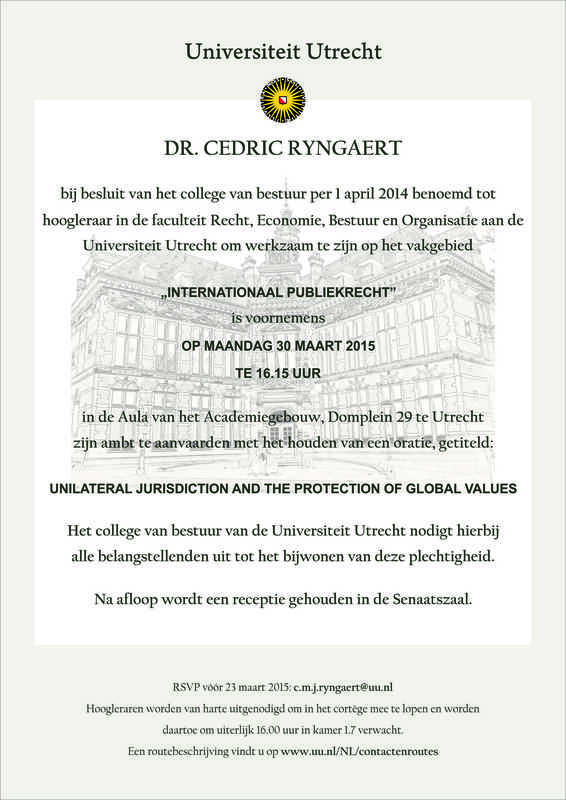 Please RSVP before the 23 March 2015 to c.m.j.ryngaert@uu.nl. A route planner is available at: www.uu.nl/NL/contactenroutes. For Dutch, please see flyer below.